How much are closing costs going to be? This is a question we frequently hear from our clients whether they are buying or selling a home in Tucson AZ. New regulations on mortgage lenders, appraisers, and title companies have, in general, increased closing costs. Closing costs are incurred by both the buyer and seller of a Tucson home. For a buyer, closing costs will be added to the purchase price of a home. The specific costs and fees will vary based on the location of the home being purchased. For example, a home in a community without an HOA will not need to pay the HOA Capital Or Transfer fees. It you are making a purchase with cash, you will not have Lender Title Insurance. So how much are closing costs going to be for the Tucson home buyer? On average, expect to pay between $2,400 to $4,500. The big consideration will be the HOA Capital Fees. Most, if not all, Adult or 55+ communities have them. This is a one time fee that will range from $1,500 to $2,600. It is worth noting the Realty Company “document handling/storage” of about $300 is only charged by some Tucson Realty Companies – NOT ALL! That means both buyers and sellers should be asking the agent they use how much are closing costs going to be if I use you and your company. Most won’t disclose the fees will be charged until it appears on your settlement statement. Save yourself $300 and choose a realtor and Realty Company that doesn’t charge that fee. We will answer the question NOW – Tierra Antigua Realty – DOES NOT charge either buyers or sellers a document handling/storage fee. So how much are closing costs going to be for the home seller? On average, expect to pay between $1,800 to $3,100. Some closing costs result from legal requirements. Others costs may be a matter of local custom and practice. The Tucson Home purchase contract and related addendum identify which party – buyer or seller – will pay which closing costs. However, these can be negotiated as part of the Tucson homes purchase or selling process. This means getting the final answer to “how much are closing costs” will depend on you and your Realtors ability to negotiate. Also, understand how much are closing costs going to be is directly related to the date the ownership of the property changes from seller to the buyer. This makes the seller responsible for expenses for the period that they owned the property. The buyer becomes responsible for expenses accrued from the date they take title. Please note, there are special considerations and limits on these expenses and who pays closing costs on VA or FHA financing. 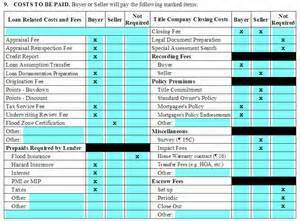 Specific closing costs are identified to be paid by the seller or buyer. Ask the realtor/real estate consultant representing you what these include. While your Realtor may be able to provide “estimates” for some of the closing costs, your lender is responsible to identify all closing costs on their “Good Faith Estimate”. The Good Faith Estimate or GFE will be provided to you within 3 days of identifying the property you are buying. A Final Closing Statement will be provided by the title company a few days prior to the Close Of Escrow. The Final Closing Statement shows all closing and adjustment costs along with how any prepaid and unpaid expenses for the Buyer and Seller. Both Buyers and Sellers need to understand their financial obligations before signing the closing documents. Ask your Realtor for assistance or additional information to help you through this important step in the real estate transaction. Our information on the Tucson Home Buying Process and Tucson Home Selling Process provides additional insight for Tucson Home Buyers and Sellers. And if you are moving to Tucson for a new job, looking for place to retire, or a winter retreat please keep us in mind. We can help!